Lalela's Youth Day activities at Hout Bay High School made the news in Sentinel Local Newspaper! Lalela Co-Founder & CEO Andrea Kerzner was featured in TC Today, the alumni magazine at Teachers College, Columbia University. Read the story online here. "I Want to Be Her" style blog along with our Lalela Scarves. Dr. Jen Welter, the 1st female NFL coach with her Heart Map Award at the UN. Lalela Learners from the South Bronx visited the UN for the first time when CEO Andrea Kerzner spoke at Women's Entrepreneurship Day. Students from Cape Town designed Heart Map Awards for the honorees, which were presented by our South Bronx students. Elle South Africa did a Q&A with Lalela CEO Andrea Kerzner after the official launch of the Lalela Centre of Art and Innovation in Maboneng Precinct, Johannesburg. Harry Styles of One Direction visited with Lalela students backstage at his concert in Cape Town. He also wore Lalela's luggage tag on-stage. Ryan Seacrest visited Lalela students in Imizamo Yethu. His visit inspired Simphiwe (pictured: far left) to write a newsletter article on the impact of celebrity engagement on youth in his community. Design Indaba, a renowned arts and design publication, showcased Lalela in August 2015. Design Indaba began in 1995 as an annual Festival that brought together the world's brightest and most innovative talent. Since then, it has grown into 'multifaceted platform committed to a better world through creativity', attracting over half a million users each year. This article is positive recognition for Lalela and connects us to the inspiring network of activists currently bettering the world and empowering others through art. Lalela partnered with the V&A Waterfront in Cape Town, South Africa to celebrate cultural heritage by beautifying a staircase by the waterfront. The staircase was designed in an N'debele pattern by Lalela facilitators Hasan and Husain Essop and painted by Lalela students. The steps received media attention from numerous local outlets, including the Cape Argus, Cape Times and the Sentinel Local Newspaper. We partnered with celebrated artist Robin Rhode for an incredible artful experience for Lalela's youngest artists. Students aged 5-8 worked with Robin Rhode to draw on the walls of the Michael Stevenson Gallery for his exhibition. What an incredible age to be featured in a gallery! Lalela made the news twice! In honor of heritage day in South Africa, Lalela students restored and revived a mural by Paul du Toit near the Bay Harbour Market in Hout Bay. Also pictured are Lalela students dressed in character for their production of A Midsummer Night's Dream for the National Shakespeare School Festival hosted by Artscape. Lalela's Ndebele-designed steps at the V+A Waterfront made the in-flight magazine of Mango Airlines. 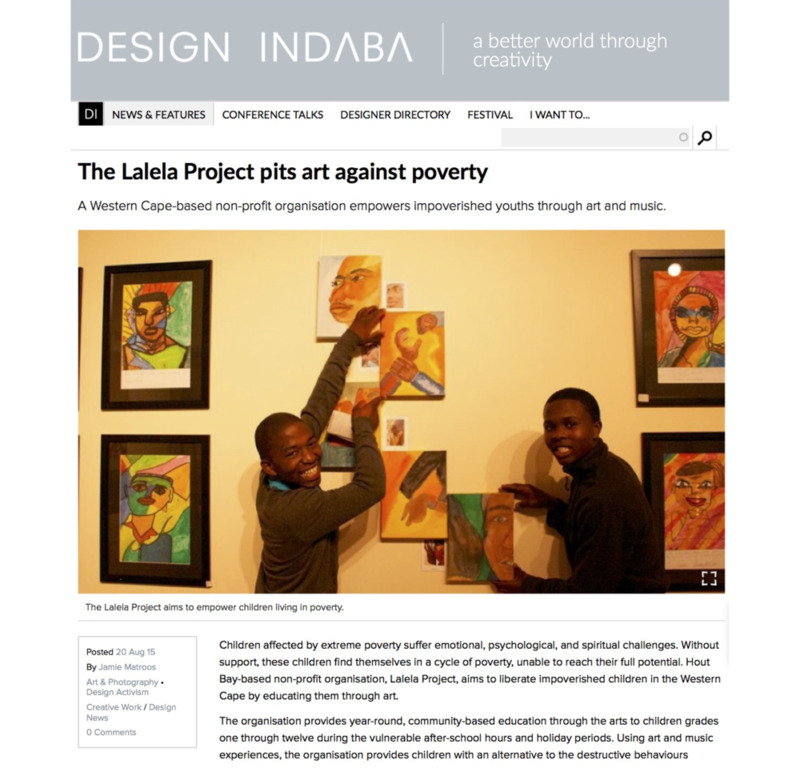 The article includes a photo of our steps and some of the Lalela students who made the design possible. Lalela's choir gave an incredible performance at the Hout Bay Market in Cape Town during Tourism Week. They were joined on-stage by Minister of Tourism Derek Hanekom. The Guardian featured Lalela's after school programmes in KwaZulu-Natal, South Africa and partnership with the David Rattray Foundation. Lalela was praised for our innovative arts curriculum, as well as our ability to empower students and excite teachers. In December of 2013, celebrity and actress Katie Holmes visited Lalela's programmes in Cape Town while filming 'The Giver'. Holmes connected with many Lalela students during her visit and later thanked Lalela on social media for having her, stating our, "talent and determination is an inspiration." In 2014, Lalela's founder and CEO, Andrea Kerzner, was named one of Future-ish's 'Citizens of the Next Century'. Future-ish is a website dedicated to cutting-edge design, science, culture and individuals shaping the future. The website's 'Citizens of the Next Century' is a selective list that highlights individuals focused on affecting change and passionate about innovation. The media recognition showcases how Lalela is innovating youth empowerment. The Cape Times paper in Cape Town, South Africa publicized Lalela's programs and our exhibit at the One&Only Hotel in South Africa.